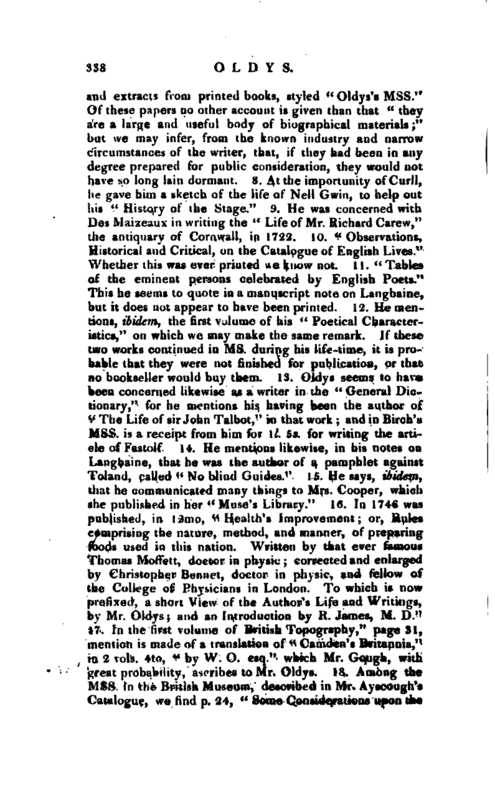 , a bibliographer of great industry and accuracy, was born July 14, 1696. He was the natural son of Dr. William Oldys, chancellor of Lincoln, commissary of St. Catharine’s, official of St. Alban’s, and advocate of the Admiralty, by a woman who was maintained by her keeper in a very penurious and private manner, and whose son, it is probable, had but little assistance in his education from parents so circumstanced. This Dr. Oldys, who was connected with Dryden and others in a translation of Plutarch’s lives, to which he contributed the life of Pompey, was advocate of the Admiralty to James II. and served king William in the same department, though he was not fully convinced of the validity of that prince’s claim to the crown. When^ he was ordered, in 1693, to prosecute those seamen as pirates who had attacked the English ships by virtue of a commission from James, he refused to obey; alleging, when he was examined by a committee of the privy council, that they were not traitors or pirates, that they had only acted animo hostili, not anitno furandi; that, though James was supposed in England to have abdicated the throne‘, his authority was still believed to be legitimate by those who had followed him in his exile, as well as by the people of that country from which the commissions had issued; and that, even if his pretensions were false, a reputed power was equivalent to a real one, according to an established maxim communis error facitjus. Sir John Trenchard, the secretary of state, declared, that these reasons amounted to high treason; but Dr. Oldys would not retract his opinion, in which sir Thomas fynfold readily concurred. The doctors Littleton and Tindal, on the contrary, maintained that James had no right to grant such commissions, and that all who acted under them were pirates. 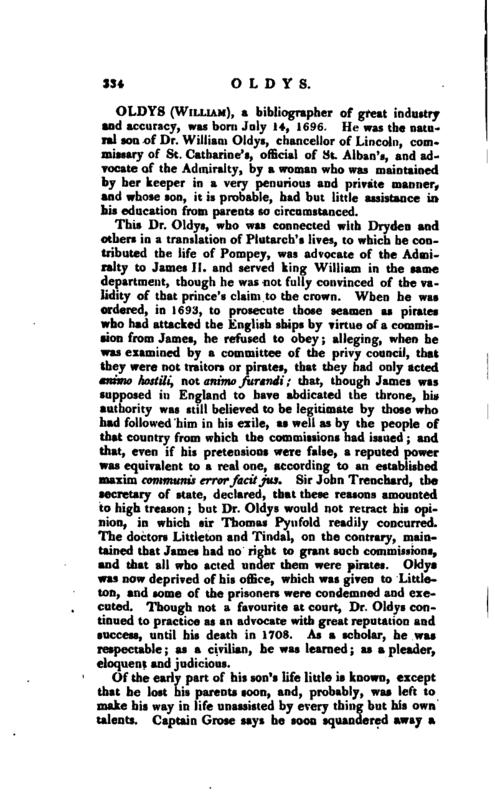 Oldys was now deprived of his office, which was given to Littleton, and some of the prisoners were condemned and executed. Though not a favourite at court, Dr. Oldys continued to practice as an advocate with great reputation and success, until his death in 1708. As a scholar, he was respectable; as a civilian, he was learned; as a pleader, eloquent and judicious. Of the early part of his son’s life little is known, except that he lost his parents soon, and, probably, was left to make his way in life unassisted by every thing but his own talents. 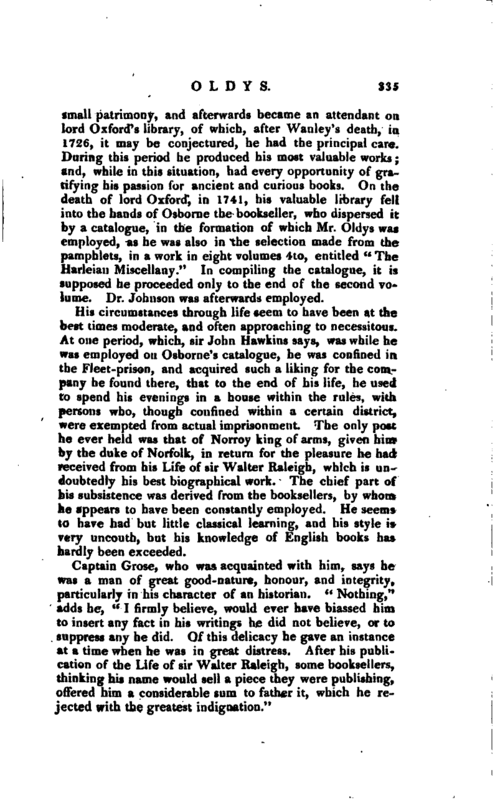 Captain Grose says he soon squandered away a | small patrimony, and afterwards became an attendant on lord Oxford’s library, of which, after Wanley’s death, in 1726, it may be conjectured, he had the principal care. During this period he produced his most valuable works; and, while in this situation, had every opportunity of gratifying his passion for ancient and curious books. 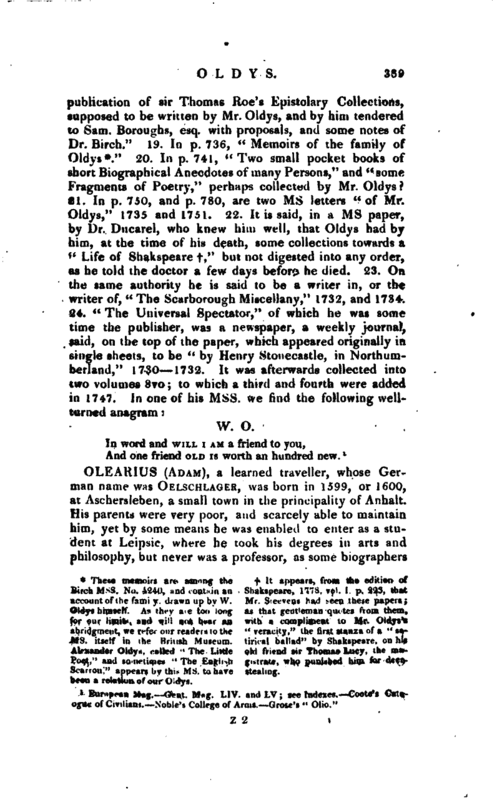 On the death of lord Oxford, in 1741, his valuable library fell into the hands of Osborne the bookseller, who dispersed it by a catalogue, in the formation of which Mr. Oldys was employed, as he was also in the selection made from the pamphlets, in a work in eight volumes 4to, entitled “The Harleiau ’Miscellany.” In compiling the catalogue, it is supposed he proceeded only to the end of the second volume. Dr. Johnson was afterwards employed. His circumstances through life seem to have been at the best times moderate, and often approaching to necessitous. At one period, which, sir John Hawkins says, was while he was employed on Osborne’s catalogue, he was confined in the Fleet-prison, and acquired such a liking for the company he found there, that to the end of his life, he used to spend his evenings in a house within the rules, with persons who, though confined within a certain district, were exempted from actual imprisonment. The only post he ever held was that of Norroy king of arms, given him by the duke of Norfolk, in return for the pleasure he had received from his Life of sir Walter Raleigh, which is undoubtedly his best biographical work. The chief part of his subsistence was derived from the booksellers, by whom he appears to have been constantly employed. He seems to have had but little classical learning, and his style is very uncouth, but his knowledge of English books has hardly been exceeded. Captain Grose, who was acquainted with him, says he was a man of great good-nature, honour, and integrity, particularly in his character of an historian. “Nothing,” adds he, “I firmly believe, would ever have biassed him to insert any fact in his writings he did not believe, or tcv suppress any he did. Of this delicacy he gave an instance at a time when he was in great distress, After his publication of the Life of sir Walter Raleigh, some booksellers, thinking his name would sell a piece they were publishing, offered him a considerable sum to father it, which he rejected with the greatest indignation.” | From the same authority we learn, that Mr. Oldys, if$ the latter part of his life, abandoned himself to drinking, and was almost continually in a state of intoxication. At the funeral of the princess Caroline he was in such a situation as to be scarcely able to walk, and actually reeled about with a crown on a cushion, to the great scandal of his brethren *. He is said also to have been much addicted to low company. His excesses, however, seem not to have shortened his life, though they might render his old age unrespected: he died April 15, 1761, at the age of sixty-five, and was buried the 19th following in the North aisle of the church of St. Bennet, Paul’s -wharf, towards the upper end of the aisle. 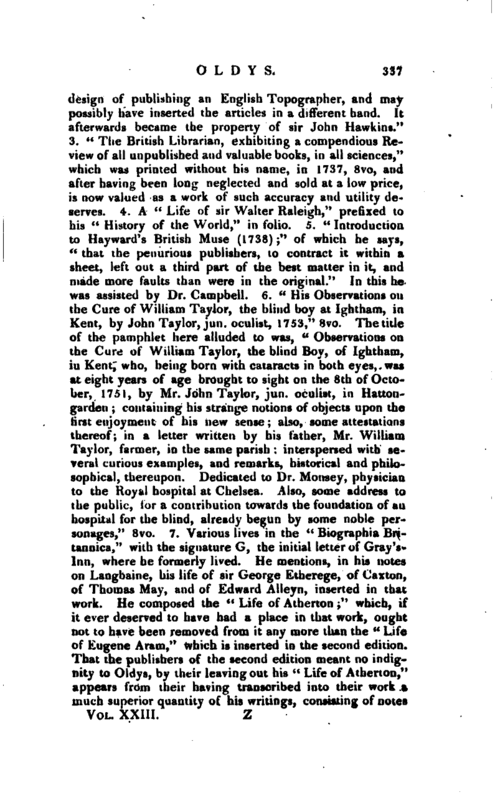 He left no will; and the property he possessed was barely sufficient to defray his debts and funeral expences: administration therefore was claimed by, and granted to, a creditor, Dr. Taylor the oculist, to whose family he was under obligations for acts of kindness to him beyond the loan of the money for which he was indebted. * This story is doubted by Mr. No- funeral occasions, is always carried by ble, who says that the crown, on such Clarenceux, not Norroy. These memoirs are among the Birch Mss. No. 4240, and contain account of the favniy, drawn up by W. Oldys himself. As they are too long for our limits, and will not bear an abridgment, we refer our readers to the ms. itself in the British Museum. 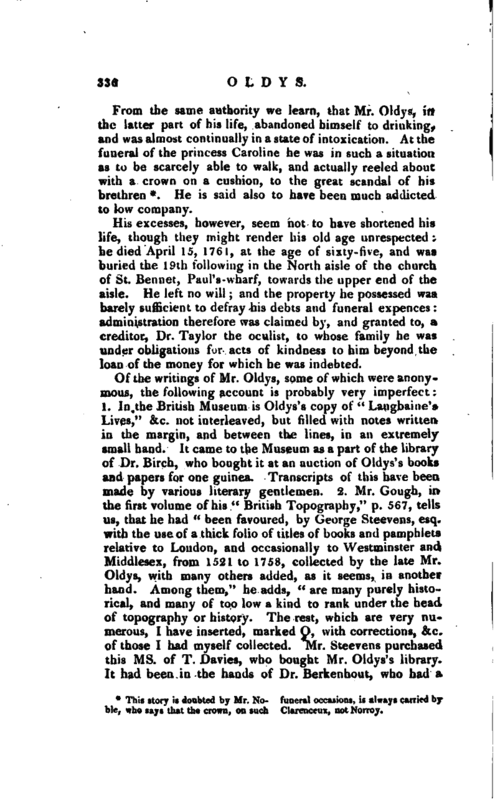 Alexander Oldys, called ‘ The Little Poet,“and sometimes ” The English Scanon," appears by this ms. to have been a relation of our Odys. It appears, from, the edition of an Shakspeare, 1773, vol. I. p. 223, that Mr. Stevens had seen these papers as that gentleman quotes from them, with a. compliment to Mr. Oldys’s “veracity,” the first stanza of a “satirical balad” by Shakspeare, on his old friend sir Thomas Lucy, the magistrate, who punished him for deerstealing.